American Crafts motto is "The Color of Memories". Well, I can't agree more. I have always loved their bright, vibrant, fun colors and now those colors have been translated into their Zing embossing powders. These are not your ordinary primary color embossing powders girls. I am talking names as delicious as their hue! Cricket, Wave, Leaf...you get the picture. These Zing embossing powders come in four types: Opaque (20 colors), Glitter (Glittah! as I like to call it) (8 colors), Metallic (9 colors), and Fluorescent (8 colors). These fresh colored embossing powders coordinate so wonderfully with the color palette that we all adore from American Crafts! I like to use my embossing powders in fun and unique ways so I tested them not just on paper but also on fabric, plastic, grungeboard, canvas board, glass and acrylic. I am happy to report that they were fantastic on all those surfaces. The container is cylindrical and has a nice wide opening making it easy to dispense and easy to return the powder to it's home. I think it's usefulness is rather a subjective thing. Personally, I love heat embossing and the added "umph" it gives to a project. The dimensional and glossy/glittery effect it gives to an ordinary stamped image to me is a bonus! The real bonus is it's results on all types of surfaces. This makes it a very versatile product. - I love that so many of American Crafts colors that I savor are available in embossing powders! (e.g. Cricket, which happens to be one of my favorite AC colors) More colors means more options when searching for that "just right" color. - I love that there are four types of powders to choose from. The possibilities are huge here! I especially like that there are 45 choices available to me. No more boring colors! I think I would have to agree with American Crafts that these embossing powders are amaZING!!! - I love the results! No matter what type of powder or what type of surface I tried, the result was always excellent! - This is a hard one for me since I really liked the results and I love the colors. I guess the one thing I noticed is that it took a bit longer for the powder to "set up". Not a big issue at all and one easily remedied by putting my heat tool closer to the image. Overall, I can't find anything that I didn't love about this amaZing powder! 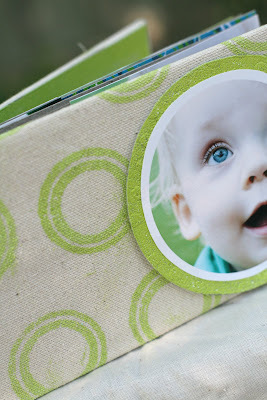 A fabric stamped album: Here I used the Cricket colored Zing powder on my fabric stamped album. I followed the steps for heat embossing but just did it on a piece of fabric and then wrapped it around a chipboard album page. The embossed circle is a piece of grungeboard heat embossed with the Cricket color as well. 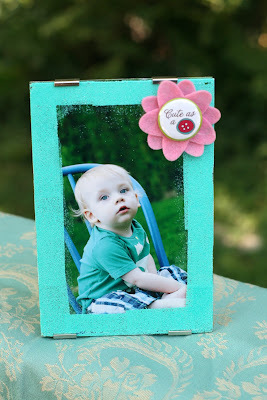 Photo frame: Here I used a $1 photo frame and heat embossed around the edges of the glass to create a fun, funky border. 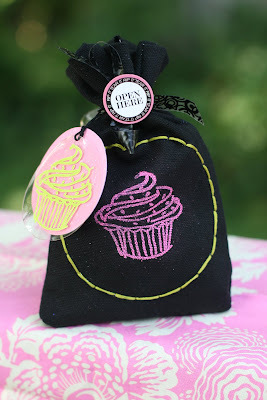 Fabric stamped birthday goodie bag: Again I stamped and heat embossed onto fabric but this time on a darker color. I thought the Fluorescent Zing would really stand out this way. I also heat embossed a piece of plastic for the circle embellishment. Supplies: Zing in Fluorescent Neon Pink and Cricket, DMC floss, fabric from JoAnns, glitter paper Doodlebug, Hambly plastic sheet, 7 gypsies sticker. 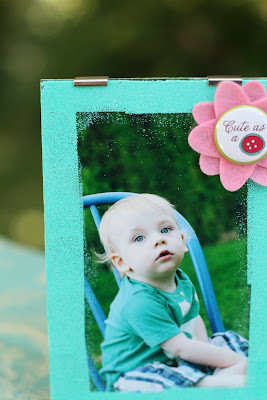 Acrylic album: This is an all acrylic album that I heat embossed with my favorite Zing color Cricket! The powder was wonderful on this surface and looks and feels really cool! Supplies: Acrylic album Maya Road, Zing in Cricket, fabric strips JoAnn fabric, MR chipboard letters for mask, Scribbles dimensional paint. Personally I love having so many incredible colors to choose from now. I like the result I get from using these powders and I would highly recommend this product to scrappers and stampers who want a change from the ordinary colors of embossing!! I think you will enjoy your results! It's versatile and seems to do well on different surfaces and the colors are amaZING! What do YOU think? Have you used Zing? What did you think? Drop us a note and let us know! I really love the ZING powders. I've bought a couple and they're so consistent. I've had problems in the past with other powders not heating up evenly and looking mottled. I've never had that problem with the ZING powders. I would definitely like to try the glitter ones! I haven't had any good experiences with the other brands I've had. The glitter kept falling off regardless of how long I set the powder. I have tried the Zing powders and I like them. The thing I like about them is the size of the powder particles themselves. I have in the past had issues with embossing powders that were either too chunky or too fine. This powder is just right. The colors are also great. I have noticed that although they are intended to match current American Crafts lines they are also great matches to many other popular brands. I'm also happy to see truly eye popping colors because for much too long embossing powder was colored but lacked true vibrancy. Yes you could find lots of colors but Zing! IMO has set a new standard for truly great color. I have always loved Zing and love their colors. They have a nice variety and I've always found them to be a good quality. I've never used the Zing powders before - your review has intrigued me though and so I might need to give them a try! love your in depth review, and your projects are inspiring! Thanks! I havent tried this yet but might have to give it a try. Okay, now I'm FORCED to try this out! Those colors are so fantastic, wow! And I didn't know you could heat emboss on fabric! What about leather by the way? Does that work? I've had my eye on these-I love the avail. colors-I just don't have a project yet to use them on-I can't wait to play with them though! Oh I absolutely LOVE ZING, Seriously. I put zing on some tim holtz metal embellies and some grunge, I loved the way that the zing adhered to it! I was not sold on heat embossing. It didn't interest me in the slightest. Then I read a post here about it. I talked about wanting to try it for months before I got a heat tool and some embossing powder for my birthday last month. I just so happened to get Zing! powder. I also got a jar of Distress powder. Although I love the colour of my Distress powder, I love my Zing! overall more. I can't wait to buy more colours.